I get an awful lot of people trying to sell me all kinds of junk all the time, why should I waste my time here looking at this shirt? Yes, indeed, time is money and both money and time need to be spent wisely. You should buy this shirt because it is cool and stylish for starters, but it is also made better than most men’s dress shirts. The resolution of a phone or computer liquid crystal display cannot really do justice to the quality of this shirt. This shirt has its own style of buttons like all of the color variations in the All Occasions dress shirt line. The buttons on this shirt are sourced from a high end button manufacturer in Germany whose primary market is art project sewing. The fabric used to make this shirt is 100% Kona cotton. Kona cotton is a patented and trademarked quilting fabric. Kona cotton is made by first selecting the best grade of cotton fiber then weaving this fiber into a high thread count tight weave fabric. Kona cotton has a higher strength and durability than cotton fabrics of the same weight. Kona cotton clothing could be looked at as a good long term investment. Besides being more durable, Kona cotton is made with non-toxic and non-allergenic dyes. Kona cotton is approved for use in bedding material for infants. Big box stores sell garments made of fabrics colored with toxic dyes that leach lead, cadmium, mercury, and other toxins into the bodies of people wearing these clothing items. Kona cotton is a great find for those with allergies or notably sensitive skin. Low end garments stained by toxic dyes eventually wind up in landfills, thus leaching these pollutants into ground water and eventually effecting the rest of the local ecosystem. The wholesale price of the fabric used to make this shirt is about the same as the retail cost of a cheap men’s button up shirt sold at a large box store. Yes, this shirt has a higher cost, but unlike other shirts this one is a great long term style statement in your wardrobe.. In addition to being stylish and cool, this shirt is made with a high degree of social responsibility. We at Quantum Cat Designs are committed to keeping production in the USA, supporting American industry, and providing jobs for Americans. Despite America still being classified as a wealthy nation by economists, there are still many Americans at this time who are in need of employment and are struggling financially who would value your support. Style Points: Pink: yes this shirt is trimmed in pink! This shirt is a definite wardrobe must for the bold and self- assured. 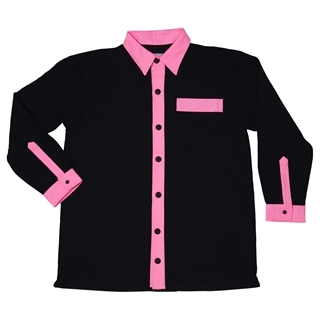 It takes a dash of self-confidence and boldness to rock a pink trimmed shirt, but the effect is great. This shirt has a high degree of sizzle and style. This design is great for dates and nights on the town. Let your individuality and self- confidence show with this design! This shirt is a definite attention getter and conversation starter. Put this shirt on and make a splash on your next outing.